It’s also been a great World Cup for marketers. It’s been a truly social competition, both on and off the pitch. 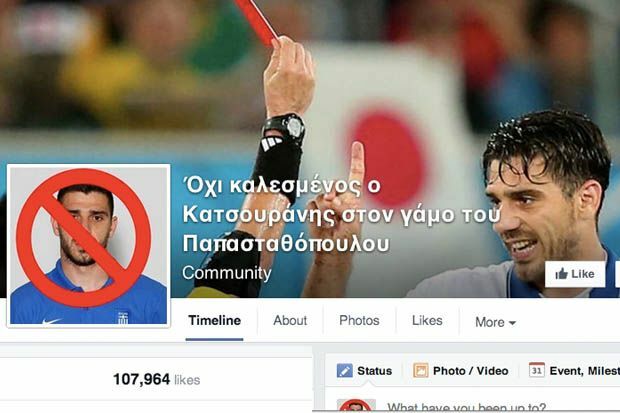 A Greek Facebook page set up suggesting that Katsouranis, who helped lead them to their Euro win in 2004, should not start the game against Costa Rica, garnered over 100,000 likes by the time their game kicked off on Sunday. Did you guess what it is yet? As much as I’d love to do a post covering some of my favourite Suarez-bite-related memes, I’m not going to. Instead, what I wanted to talk to you about is customer perception. And more football. Headbutt Pepe: 1 game, elbow Sahko: no punishment, bite: 4 months ban. All insane, all on purpose, 1 doesn’t hurt. Bas and I exchanged a few tweets last week about other shocking World Cup incidents, compared to the Suarez bite. There’s plenty to choose from in this tournament alone (so I don’t need to talk about *that* headbutt), so why haven’t we heard more about these? Why is all the focus on Suarez? If we rate these on a scale of bad to worst with The Bite, where worst could cause serious injury or potentially end someone’s career (I’m sure we’ve all seen tackles that ended in a broken leg, or a player never kicking a ball again), The Bite is probably at the lower end of the scale. Yes it’s nasty, yes it’s shocking and it has no place on a football pitch. But why did it earn Suarez a ban for 9 months from internationals and for 4 months from any football related activity, whereas the other perpetrators have gotten away relatively scott-free for other dangerous incidents? This is where perception comes in. And this is the crux of the matter. For Suarez, is our view (as the consumer) harsher because he’s done this twice before? Is it made worse for those of us who have watched his club career recently and seen it also blighted by bans for racism and reports of diving? While he’s since come out and apologised to Chiellini, did the initial protestations, denials and claims of “a witchhunt” from the Uruguayan camp result in a harsher punishment? A customer’s view of our brand can be influenced by the things they see on social media, or hear about from other people, as well as their own personal experience. In the absence of their own dealings with you, their opinion may be entirely based on feedback from others. The kicker here is that in this case, the things they are hearing might not be completely true, or even fair. I’m sure we all have experience of dealing with customers who may have been completely unreasonable in their demands, who don’t see that you may be doing all you can to deliver a good experience, who then go off and bad-mouth you to all and sundry. That’s the world we live in and why brands can pay such big bucks for reputation management. Think Burberry – a few years back this classic British brand was known as a “chav” brand despite beautiful marketing and products. You could argue this was an unfair label and it’s taken the brand some time to successfully shake off this image which damaged sales. Their use of social media and marketing has had a huge part to play in this revival. Not only did I think it was one of the best adverts I’d ever seen, but it made me rethink what I thought of the brand. Plus, who isn’t won over by a car made of cake? Dominos suffered a major PR disaster when a video of two staff members from a US franchise doing rather unpleasant things to food went viral on YouTube. It took only a few days to do catastrophic damage to the brand and their initial plan for how to respond didn’t help. In trying to avoid adding fuel to the fire, they came across as uncommunicative. So they tried something else and responded with a video of their own, featuring their CEO apologising and thanking the wider social community for flagging up what happened. Since then Dominos has worked hard to use social media to its advantage, even dedicating an entire microsite to social feedback on their new recipe. The point I want to make is that customer perception isn’t always right (compared to what we as brand owners might think it should be) and it’s often not fair. While social media can often exacerbate this situation and create mountains from proverbial molehills, it can also be one of the best ways to moving forward if you find yourself with this problem. When it comes to working out what that way forward should be, plan now. Don’t wait for a crisis to plan how you’re going to deal with it. Work with your PR, branding, social and customer service teams amongst others to come up with potential scenarios and how you’ll manage them as a brand. Establish what your brand personality and tone of voice will be, if you haven’t already. In a sticky situation will you deny everything as Suarez did initially? Will you get senior figures talking to your customers trying to build trust like Dominos? Can you use quirkiness and charm like Skoda? Or will you focus instead on telling the story you want customers to hear, like Burberry? Utilising social media listening tools and sentiment analysis can help you track the impact of your response, as can reaching out to key customers or influencers familiar with your brand – they’ll be able to tell you if what you’re doing is resonating in the right way. Having a Plan B in case Plan A doesn’t work is probably a smart move. I agree with you that it’s all about perception, but I disagree about the emphasis you place. In football, physical contact is common and even to an extent an accepted part of the sport. People use their legs, heads, and arms – elbows included – and sometimes this causes injury, intentional or otherwise. A bite, however, is not a common form of physical contact. On the contrary, a bite is always a deliberate intent to injure someone. It’s something feral, something primal, and something that has no place in any sport, ever, in any circumstance. That’s why Suarez is punished so hard. If he’d headbutted someone, the punishment would have been much less severe, of that I’m sure. But he bit someone – the third time he crossed that line and attacked another player in this supremely feral manner – so that’s why he was penalised so heavily. So yes, it’s perception – but not the perception of Suarez, but the perception of the bite as a physical attack. Barry – I completely agree with you – personally I feel Suarez should have been banned for life as I think it’s likely he’ll do it again – It’s something we should never have to see in any sport under any circumstances. Given that it’s his third time and he’s also headbutted a referee following a red card, do we think he’ll ever change? However my role in the article is to play Devil’s Advocate so I try and set my own views aside for a minute. I think we’ve seen plenty of non-bite related incidents where the intent has also been to injure someone, yet these haven’t seen the same level of punishment. Regardless of how someone does it, whether you bite, elbow, go in studs up, if the intent to hurt/cheat is there and the end result is potentially worse than leaving a few teeth marks, should the potential punishment be more severe? Otherwise, how you will eliminate elbows and things like diving from the game? That’s the great thing about perception – we all have our own views and none of them are wrong! You’re right. But it’s also exactly the point: it is primal and not a common form, so that’s why they are tough. And I don’t think anyone disagrees that Suarez should be punished hard, but it is about how things are looked at. A bite is worse because it’s not common. But ‘common’ doesn’t make it all right. Look at the Song one. How is that accepted as being part of the game? Running behind someone and hitting him like that? Why is that accepted? It shouldn’t be. Or Pepe giving a headbutt with the ball not even in play. If it’s in an attempt to get the ball, yes, but Song’s one for example should be punished just as hard, as should Pepe (who also is a habitual offender). So the perception argument I think is very valid. If players now start biting, in a few years time the ban for biting will be 1-3 games as well. That should not be the case, it should always be punished hard, just like the headbutts and Song hitting someone. Disagree, Bas. I might be wrong but I don’t think players ever received 2-4 month bans for headbutts, elbows, or other such shenanigans. Yes there have been lengthy bans for extreme physical violence (http://soccerlens.com/football-bans/93974/) – as should be the case – but general contact like elbows and meeting of heads has always been a more or less common, if inappropriate, element of the sport. Biting however is and always will remain an exceptional situation, as – like I said – it’s such a feral and shocking physical attack. As a result it will always be subjected to much stricter punishment. Actually, when the headbutts first came along players were banned much longer, I remember a 6 months ban in Holland. Now it’s more accepted. But you’re making my point: they are considered an element of the sport, where they shouldn’t be. Why should a headbutt be part of the game? It shouldn’t be, because it has nothing to do with the game, as does biting. Why are we saying something like a headbutt is relatively ok and a bite is not, if both should be banned from the game, because both have absolutely nothing to do with the game itself and both are primal reactions. Just one is used more and so we accept it. That’s perception I think. A headbutt should not be perceived as an element of the sport because it’s not part of the game, it’s just more common.